A suicide attacker detonated a car bomb outside an ice cream parlour in the Iraqi capital, Baghdad, killing at least 10 people and injuring many more. 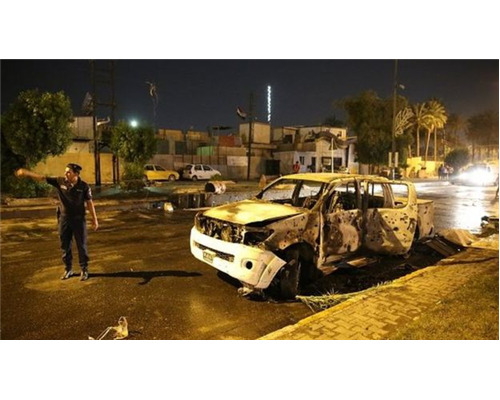 The attack happened in the mainly Shia Muslim Karrada district where a crowd of people had broken their fast after sundown during Ramadan, officials said. So-called Islamic State (IS) said via its Amaq news agency that the target had been "a gathering" of Shia. IS has carried out many attacks on Shia, whom it regards as apostates. Brett McGurk, the US envoy to the coalition against IS, condemned the overnight attack in a post on Twitter. "Isis [IS] terrorists tonight in Baghdad target children & families enjoying time together at an ice cream shop. We stand w/Iraq against this evil," he said. IS has stepped up attacks in the capital since the Iraqi army, backed by the US-led coalition, launched a campaign to retake the city of Mosul in the north four months ago.